Here’s something a bit different to chicken but just as easy to cook. I’ve chosen to stuff it with sausagemeat because the juice and flavour from it enriches the guinea fowl and helps keep it moist. 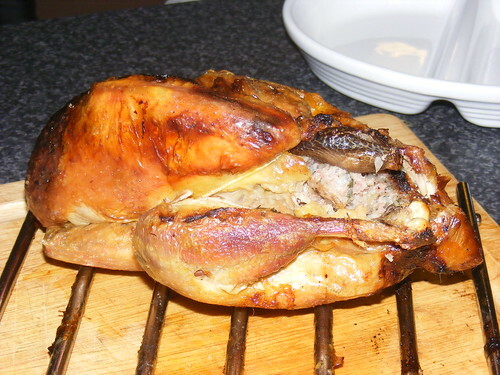 When you stuff a bird you have to adjust the cooking times to make sure that the stuffing cooks through but the meat doesn’t overcook, which can be a bit of a balancing act, but as long as you follow these general rules it’ll all turn out fine. Mix together all the stuffing ingredients (that is, everything that’s not the bird and the butter) until they’re well-mixed. Identify the neck and bum ends of the bird and at the neck end loosen the flap of skin from the breasts. Pack about 1/3 of the stuffing mixture inside and then secure the flap of skin back down with a couple of cocktail sticks. Put the rest of the stuffing up the bird’s rear end (fnarr fnarr etc). 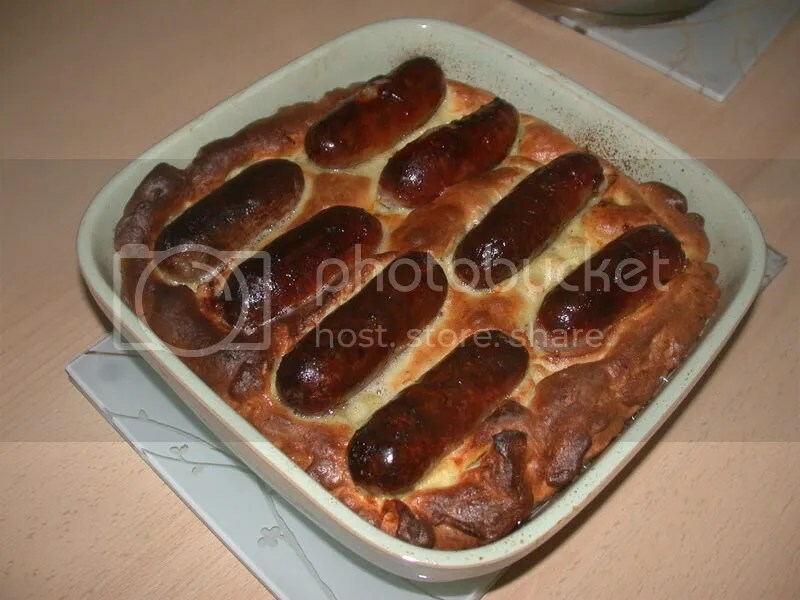 Toad in the hole, for those that don’t know, is basically sausages in Yorkshire pudding batter. No toads involved. No one seems very sure where the name comes from – there is a theory that it originated from a pub game of the same name and while I don’t quite see the link, I hope it’s true. I’d like all my food to be named after pub games. 2 tablespoons lard (LARD! ), dripping or oil. To make the batter; whisk together eggs, flour, milk, water and mustard. Whisk it well so that it’s nice and smooth with no lumpy bits and it’s about the thickness of runny custard/cream of mushroom soup/double cream (pick a comparison you like). Season with salt and pepper. Set it aside to rest for at least half an hour. This is so that the flour absorbs the liquid properly and relaxes and the whole thing comes to room temperature. Now get the oven nice and hot – 220C/450F/Gas mark 7. Put the sausages in the baking tray and stick them in the oven for 5 or 10 minutes without turning them over until the tops are brown. This means that you’ll have one brown side and one pale side. Take the sausages out of the baking dish and set them aside. Put the lard into the baking tray and put it back in the oven. Wait 5 minutes or so until the fat is really, really hot and sizzling and then quickly remove from the oven and pour in the batter. It’ll sizzle pleasantly. Quickly pop the sausages in the batter, pale side up, and put it straight back into the hot oven. Leave it for 25-30 minutes. Resist the temptation to open the oven door, the cold influx of air may make the batter collapse. After 25 minutes, it should be all puffed up and golden brown. Serve it immediately with some gravy and maybe some greens like peas or cabbage.